Rice pudding: warm, comforting, soft, undemanding. It is the perfect food to be eaten slowly, when you are curled up in a blanket, watching a sad movie. In fact, a soft pudding of rice and milk was initially considered food for invalids or those of delicate constitution. I am giving you two recipes today. One is my grandmother’s which I am calling Blue Monday Rice Pudding which is baked for several hours. 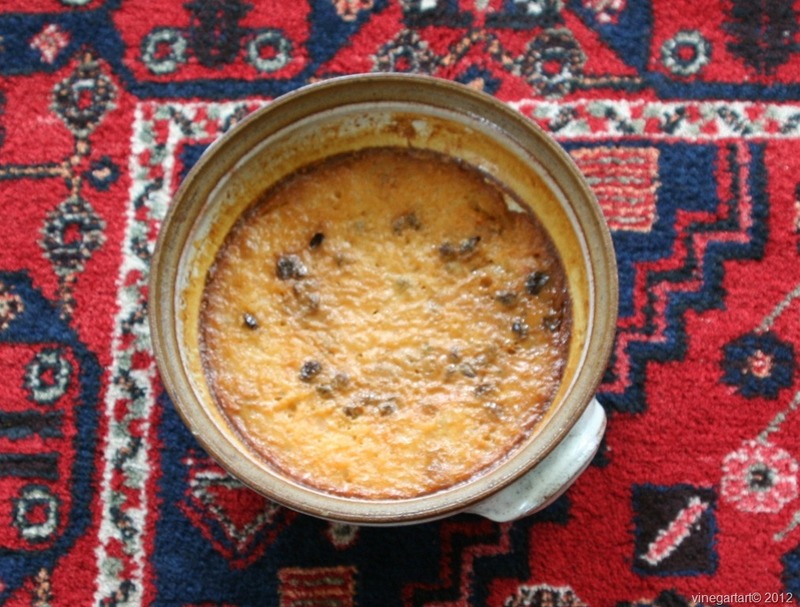 The second is a speedier stove top version, Rice Pudding with Bay Leaves. In my previous post I proclaimed to one and all, I was going to find ways of using my life time supply of bay leaves. 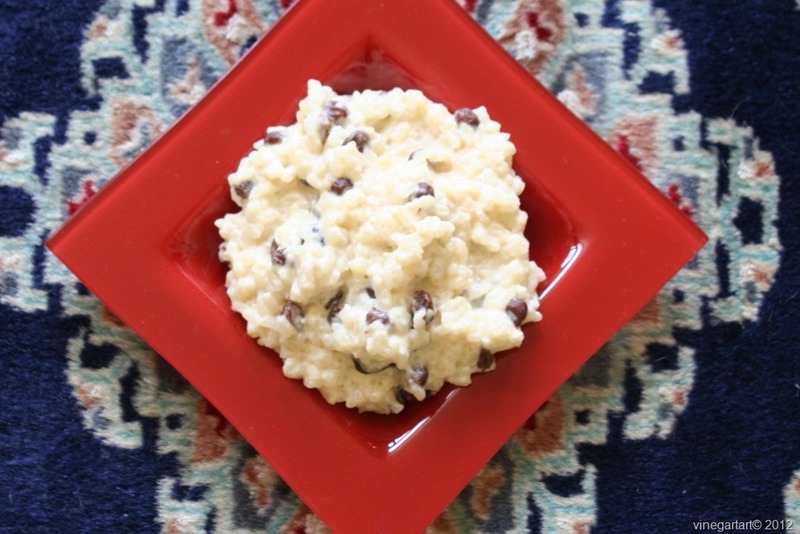 Rice pudding has a long history. Almost as long as the history of rice in North America. The Greeks write of rice in 326 BC and a mere two thousand and twenty years later in 1694, America is introduced to rice and, today, it is the largest exporter of rice in the world. there are no less than six variations of rice pudding most with large quantities of eggs (from 8 to 14) and all are made with milk. Spices range from cinnamon, nutmeg or allspice or simply “spice” which might be all or none of the ones mentioned. All these rice puddings are baked for several hours. My grandmother, Queen Victoria Stansfield, made rice pudding on wash day Monday. The pudding baked slowly while the arduous, exhausting job of doing the laundry was tackled. Monday supper consisted of Sunday’s leftovers and a pudding that baked all day largely unattended. Her name really was Queen Victoria. It goes without saying she was born on May 24th, Queen Victoria’s birthday. In your recipe collection, you no doubt have recipes where you are instructed to wash or rinse the rice prior to using. Historically, this rinsing was a cleaning process used to remove impurities such as dirt, twigs or bugs. Later on, rinsing was used to remove the polishing additives – talc, glucose or starch. The amount of sugar used in these historical rice puddings was small which indicates that sugar was a rare and expensive ingredient. It is my observation, as we move forward in history, the amount of sugar used is tripled or even quadrupled especially in the last 40 years. I am sticking to the historical use of sugar treating it as a precious ingredient. So…go and put in a load of laundry and while you are labouring be comforted in knowing that a warm, delicious reward is at hand. The following is hand written on an old recipe card. 2 tablespoons of well-washed rice and 2 cups of milk in a deep pudding dish, well buttered. Cover, and bake slowly for 1- 1/2 hours, stirring occasionally. Add: 1/4 teaspoon salt, 1/4 cup sugar, 1/2 cup raisins, 1 teaspoon vanilla. Bake 2 to 3 hours longer. 1. In a small saucepan, bring two cups of water and two bay leaves to a boil. Add rice and return to a boil. Remove from heat and drain. 2. In a large sauce pan add rice, bay leaves, milk, sugar, salt and raisins. Bring to a boil. Reduce heat to a gentle simmer and cover. Be careful not to let the milk scorch on the bottom of the sauce pan. I have made this recipe with both Arborio rice and sushi rice. The Arborio rice took more milk. The idea is to have a very creamy pudding – not dry. It will take 3/4 – 1 hour to cook. When finished cooking, remove the bay leaves and add the vanilla. 3. Serve warm or cold. In The Joy of Cooking, Irma S. Rombauer  (p.633), suggests serving rice pudding with: cream, strawberry or raspberry hard sauce, fruit juice or hot sherry sauce. What you accomplish with the recipes I share with you is what makes me eager to share more. Tell me how you are doing. Thank you for following! Did I read that right? 2 tbsp of rice to 2 cups of milk? Yes…you read that right. You don’t have to use bay leaves in the stove top version if you don’t want to. It is darn good with just vanilla. Enjoy. Enjoyed this entry…informative and just goes to show why our collective tonnage has gone up considerably. With respect to sugar? Yes…it is quite astonishing really just how sugar has crept in and up. Kind of like “corn.” You have no doubt heard Farmer John’s rant on how corn is taking over the world. I’m still mulling over the 2 tablespoons of rice to 2 cups milk as per Jocelyn’s comment…regular rice is 1 to 2 so this seems an awfully small amount for that much liquid. It makes me feel slightly uncomfortable because of the disasterous first dinner party I ever gave where everybody ended up with 1 tablespoon of rice on their plate due to my poor math skills…please reconfirm thanks. Oh yee of little faith. I am sure Queen Victoria Stansfield would have used long grain rice not short grain rice, however, the recipe stands. Baked in a very slow oven the rice has an opportunity to plump up. The grains are not singular but more porridge like. I hope that helps. Depending on your opinion of raisins, you could consider half the amount.